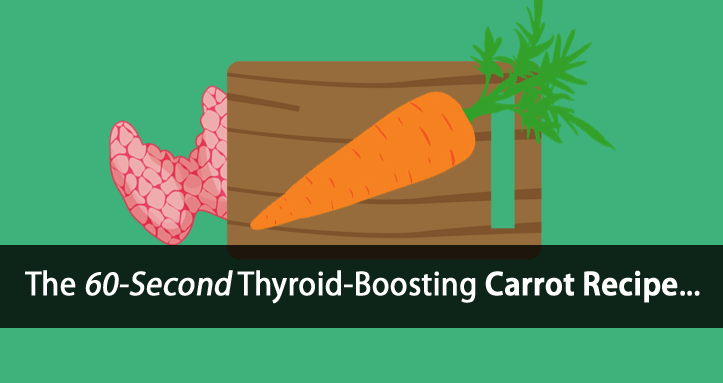 Want to know how a carrot a day can help boost your thyroid health? All you need is four simple ingredients, five simple steps, and 60 short seconds and I’ll show you how. This quick and easy thyroid-boosting recipe is so easy you can’t afford not to use it. 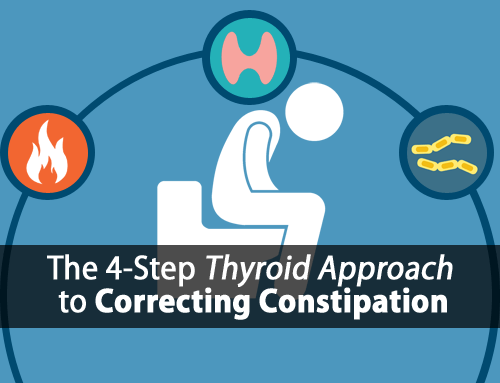 And if you suffer from Hashimoto’s thyroiditis then this is even more important for you. Just don’t take it for granted. It’s inspired by the work of Dr. Raymond Peat and a special thanks to Danny Roddy for putting this tutorial together. Believe it or not, a little carrot can have a big impact on your thyroid health. 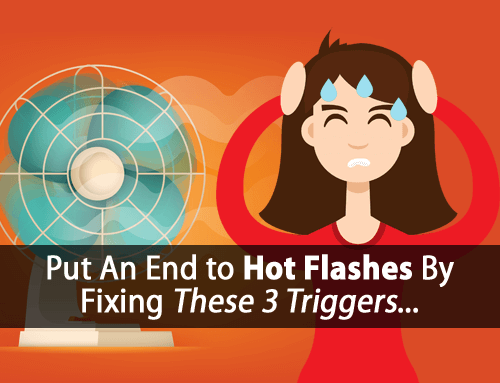 All of these are well known for driving your body’s stress response. And with hypothyroidism and Hashimoto’s thyroiditis, all can be (and often are) over-produced. They are all very thyroid suppressive and can block your Thyroid Hormone Pathway on multiple levels. 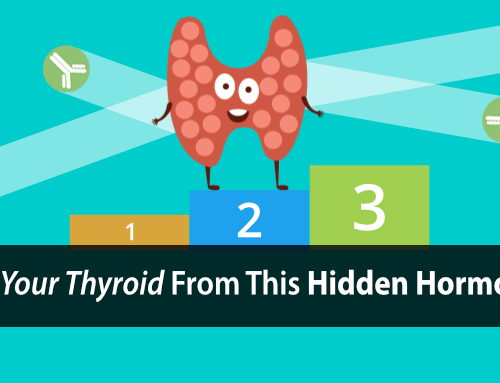 So addressing these hormones and chemicals are essential to improving your thyroid health and overcoming your thyroid condition. 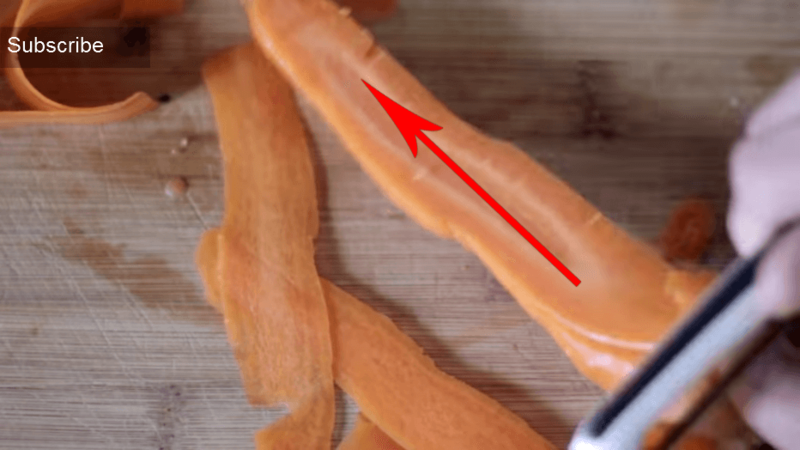 Clean and peel your carrot the same way you would normally do. 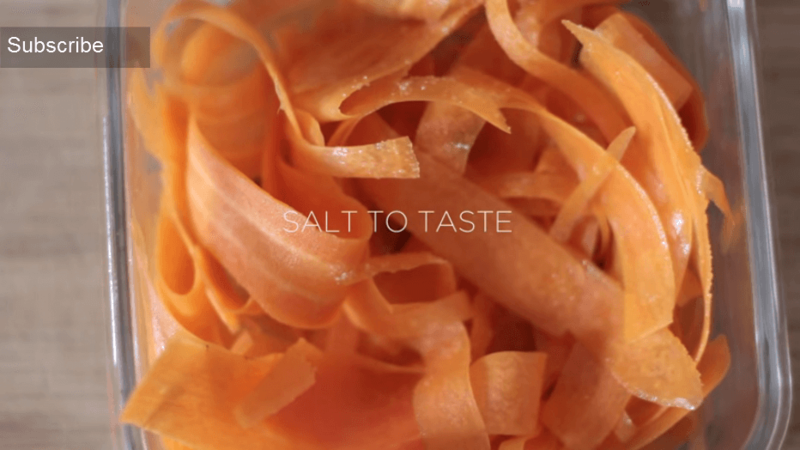 Using your carrot peeler, grate the carrot length-wise into long thin strips. Grating the carrot this way helps to maximize the absorption of estrogen within the digestive tract. 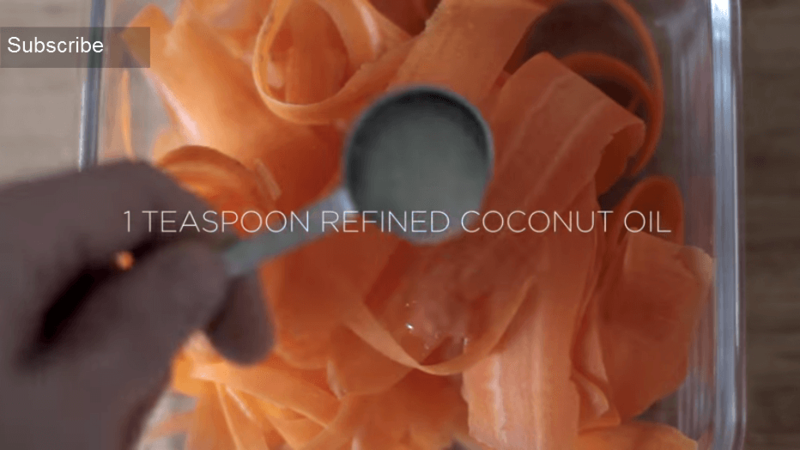 Transfer the grated carrot into a dish, warm the coconut oil if needed, add the coconut oil to the carrot and mix. Salt to your taste and mix again. 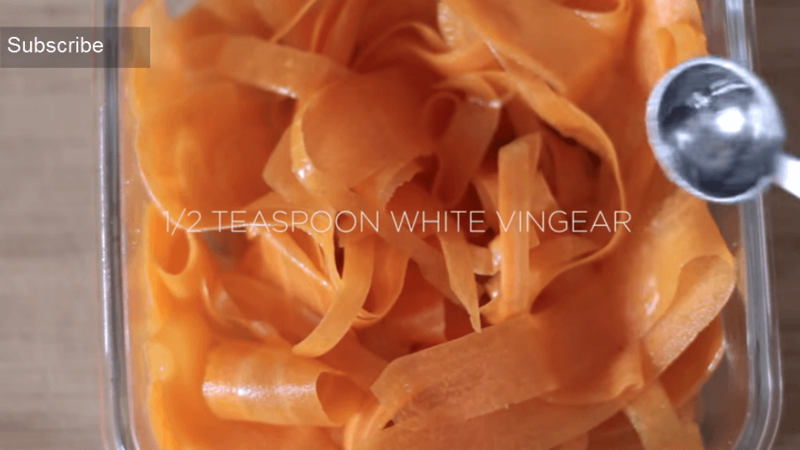 Add the vinegar to the carrot and mix again. This recipe should be used daily for the greatest therapeutic effect. Use this thyroid-boosting recipe on its own or with a snack. It’s best NOT to use with a full meal. After you make it a couple of times you can easily whip this together in about a minute’s time. You might be thinking how could something so easy actually help? Don’t underestimate the effectiveness of this simple recipe. This little recipe can provide some big and serious therapeutic benefits. Did you enjoy this simple and easy thyroid-boosting recipe? Use this daily thyroid-boosting recipe together with our 3 Food Triple-Thyroid-Boosting Daily Protocol for an even greater effect thyroid-boosting effect. Does it need to be white vinegar? Can apple cider vinegar work as well or balsamic? Hi Tina, apple cider vinegar should be fine. I have the same question… Would like to use Raw Apple Cider Vinegar instead. Will this work? Hi Rita, apple cider vinegar should be fine. As I am VERY ALLERGIC to nuts, and especially coconut, I guess that I will stick with my pickled carrots. Hi Gale, pickled carrots won’t have the same effect. We are using the carrot for the fiber so they need to be used raw. can I warm the carot salat ? Hi Manu, since we’re using the carrot fiber here we don’t want to cook the carrot. But light warming shouldn’t be a problem. 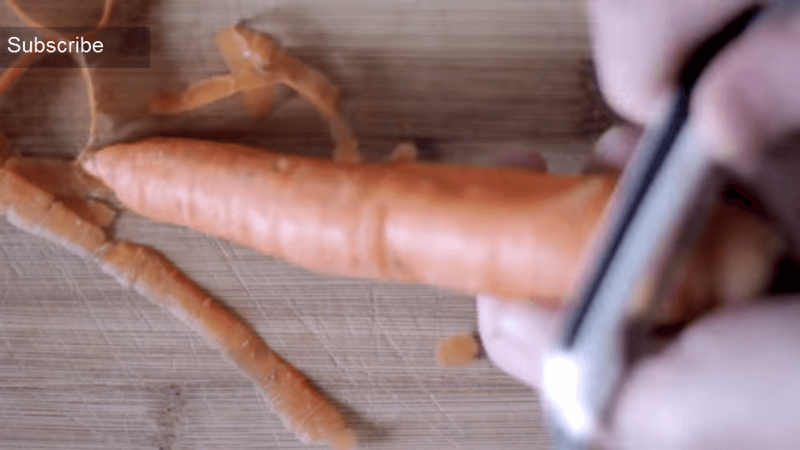 Why should I peel the carrot? Why does grating it lengthwise matter? Hi Tom, great recipe! I just tried it and like it very much, thanks for sharing!! My question, will I start to experience a ‘detox effect’ with some of these healthy thyroid recipes? I tried the salted orange juice, which I like, but noticed I was getting extremely tired after a few days of drinking it. I quit drinking it and quickly gained my energy back. Is this something I need to push through over more time or is it not for me? Hi Ann, We talk a lot about how hypothyroidism leads to the over-activation of your body’s stress response and the over-production of stress hormones. 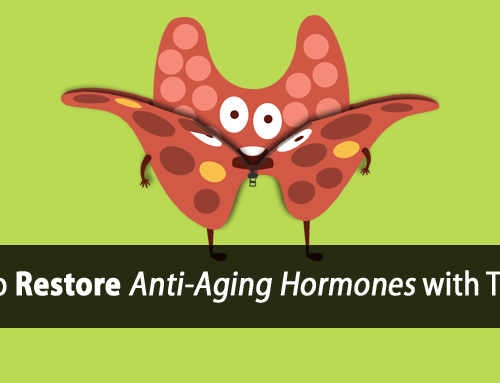 These stress hormones are generally very excitatory and can give a false sense of energy. Since salted orange juice helps to lower the stress response, it can effectively remove the excitatory effects, making you feel more tired. But it’s important to understand that this is how you actually feel without stress hormones keeping you going. We generally need to use things like thyroid hormone, coffee, etc. to help stimulate oxidative metabolism and increase energy production through the proper pathways. Hi Jenn, what I recommend is canning and pickling salt… no iodine, metals, digestive irritants, etc. Can I put this in my NutriBullet and drink it? Hi Deb, definitely don’t want to do that. We’re using the carrot fiber for the therapeutic effect. Blending it up would null this. Why is it refined coconut oil ? I thought it was unrefined that is good for you. Hi Dion, we use refined (expeller pressed) because it removes all of the coconut particulate that is still found in the unrefined oil which can cause digestive irritation. Why do I need to use refine coconut oil? Can I use unrefined coconut oil? Hi Michele, we use refined (expeller pressed) because it removes all of the coconut particulate that is still found in the unrefined oil which can cause digestive irritation. Thanks very much for the reply . I’ve been doing this for the last month and a half as a snack between meals, and OMG IT WORKS! I had my first period EVER with ZERO PMS symptoms. I had to check the calendar to see when it was coming because I had none of the usual indicators I’ve had most of my life: NO hormonal migraine, NO breast tenderness, NO acne breakout, NO cramping. It was amazing! And I feel really good that all that excess estrogen isn’t able to contribute to some unseen cancer down the road too. Hi Dawn, that’s great to hear and thanks for sharing. Does the carrot need to be organic? Also I noticed you did not answer Ann Timm’s question above. Hi Maggie, organic is probably better but not required. I tried this for many months but have problem with carrots digestion. Came out in poop and my hands turned very yellow. I tried substituting with purple carrots. But so far didnt feel any difference. I love the carrot salad but why the switch from apple cider vinegar to white? Hi Ginny, it’s not a switch. As mentioned this is one of different variations of the recipe. Regarding vinegar, can you use ordinary brown malt vinegar? That’s the only kind I have. Hi Sally, I would recommend sticking with white or apple cider vinegar. Can canned non organic bamboo shoots be used? How much a day one fourth cup? I really like this and the idea of a carrot et all. I am a male and have this issue, plus others associated with hashimoto’s. I am teaching my VA doctor a lot about what she did not know, Since i challenged her to step fully into her Hippocratic Oath as much as I took an oath to Serve the United States and not just to push a pill at me. Just wondering how many males have hashimoto’s ? Hi Ron, it’s much more common with women but doesn’t mean that excludes males. I’ve worked with plenty of men with Hashimoto’s. I’m happy to hear that you’re challenging your doctor. That’s how we learn and grow. Is this recipe for both males and females? I noticed the mention of estrogen in the recipe, and couldn’t help but wonder before I pass this along to my sons. Hi Mary, yes it applies to both males and females. What about Himalayan sea salt? I don’t have pickling or canning salt. Hi Jennifer, What I recommend is the canning and pickling salt because it’s pure salt without any additives or harmful ingredients. I don’t recommend pink Himalayan salt because it contains metals that are toxic and other components that can irritate the digestive tract. Would grating a carrot on a box grater work just as well? You’ll still have the pieces to chew so the fiber shouldn’t be affected. I think I would like it better and be more apt to eat it this way. Also, unrefined coconut doesn’t seem to cause any digestive issues for me, and I use it most of my cooking. If that is what I have on hand, is it alright to use it? Hi Donna, as long as you grate it length-wise it shouldn’t be a problem. But we use the recommended ingredients for specific purposes. We don’t recommend unrefined or virgin coconut oil. I see in your article you say to blend the bamboo shoots and use a few tablespoons a day. What do you put them in? Yes, it is chewed, but as mentioned the grating is important because of how it aligns to the fiber for maximum absorption. What about Real salt or Celtic sea salt? Hi Robin, we recommend using pure salt without any additives which also don’t contains the irritants and toxic metals oftentimes found with sea salts. Many still contain anti-caking agents. In video it’s option coconut or olive oil, should olive oil also be refined? And – is it good for postmenopausal? Hi Margaret, try searching for canning and pickling salts. I had my thyroid removed because of cancer. Does you plan work even without a thyroid? Hi Amelia, the short answer is yes, everything we teach still applies 100%. The only difference is that you will need to supplement thyroid hormone to the degree that you cannot produce it. However, it’s important to understand that just because you take thyroid hormone doesn’t mean that the hormone is getting to your cells. Thyroid hormone can get blocked many places along this pathway. For example, most hypothyroid people can’t convert inactive T4 thyroid hormone to active T3 thyroid hormone that your cells need. Thyroid hormone can also get blocked in the bloodstream, at the cell receptor, etc. If we have such a surplus of estrogen and it is beneficial to eat foods that absorb it, would it also be beneficial for women to be on a progesterone only form birth control instead of one that also has estrogen? Hi Megan, there are many concerns regarding estrogen-formulated birth control. You can open up the paper that comes in it and see the huge list of issues that they are required by law to list. However there are even more that they don’t. The problem with progesterone-only birth control is that they don’t use real bio-identical progesterone. Instead they use synthetic progestins that are also known to cause a number of issues themselves. what thyroid supplement do you reccomend ? Thank you for your wonderful work and research ! Far out! I have all this himalayan salt and now after all the hype find out it is no good?! 🙁 Doctor Sircus, Dr Mercola and Dr Brownstein appear to think it is great. Tom, I am looking and I think I will have to import some pickling salt to where I live in Australia. Is plain table salt any good? TIA. Hi Cathy, any canning and pickling salt should work fine. Plain table salt should be avoided. How much benefit would I get just to eat carrots straight up without peeling , grating or mixing with the oil, vinager and salt? I’m in my cat a lot and would like just eat carrots. Hi Jeannie, it would provide some benefit but not as much. As I expected, stirring coconut oil into cold carrots made the oil solidify and I had white lumps mixed with grated carrots. What’s your solution for this? Also, would this salt be okay? Real Salt (see realsalt.com) is from a source that’s supposed to be clean and has trace minerals that are supposed to be good for you. Not like other sea salts. It’s available in various places including Whole Foods. Better than canning and pickling salt? Hi John, most salts including sea salts contain heavy metals and should be avoided. This especially becomes with the more salt you use. Would juicing the carrot be just as good or not enough fiber? Hi Kristi, no and I highly recommend against carrot juice. We are specifically using the fiber. Carrot juice contains enough beta-carotene to suppress thyroid function. Hi, i had that question too regarding carrot juice which you gave already answered. could you please advise what foods and juices to taken with thyroid issues? I would be highly grateful to you for that! I don’t have any top teeth, can’t chew the carrots. But I chopped them into small chunks. They still have fiber that way. I just swallow the chunks. Hope this works OK. I have had a complete hysterectomy and my doctor prescribed estrogen patches (0.05). If I don’t use the patches, I get irritable and mean. I’m confused about being prescribed estrogen, but using the carrot salad to lower estrogen. My doctor did not prescribe progesterone. Should I be taking progesterone? Interesting! Tom what about those of us with Graves? Any ideas or suggestions? Funny thing, my FT 4 always runs low while my FT 3 always runs high. I have high TSI & TPO antibodies. The book recipe is for two carrots,one tablespoon oil(coconut/olive),and one tablespoon acv. Which should we be doing,the one carrot recipe or two? Thank you so much for this exquisite and tasteful recipe. I have no teeth and can’t be fitted with dentures due to bone loss. Any suggestions? Second time for this question. A million thank you’s for sharing all this information. I have been having the 3 food protocol every morning for my breakfast complete with everything that you recommend, and I have been having the carrot recipe each day too. Also, been having the cottage cheese with apple as a snack. All this for about six weeks now…. and I have to say my inflammation pain that was plaguing me has diminished. I also started taking NDT 15mg three times a day and I feel so much better. I am 77 years old and now I feel like I am a 60 year old! Thank you again. I will continue to read your excellent information.